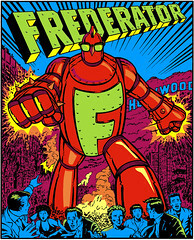 The Frederator Studios Blog: Record labels. Postcards, Series 5. I've gotten more comments on these postcards than anything else we've ever sent out. Bang and Red Bird were leading independent pop labels in the 60s, both owned by among the most legendary figures in the mid-20th century record biz. Bang Records was started by Bert Berns and Atlantic Records' Ahmet and Neshui Ertegun, and Gerald (Jerry) Wexler; the name came from the first letters of their first name. Today the label's best known for being the first solo home of Van Morrison (Brown Eyed Girl & TB Sheets), Neil Diamond (Cherry, Cherry & Kentucky Woman), and great hits by the McCoys (Hang on Sloopy). Red Bird Records was the short-lived indie formed by Jerry Leiber, Mike Stoller, and George Goldner and the spiritual home of the girl groups (like The Dixie Cups & The Shangri-Las). Vocalion Records first showed up in 1920 and is well known for 78s by Billie Holiday, Duke Ellington, and most of Robert Johnson's legacy.